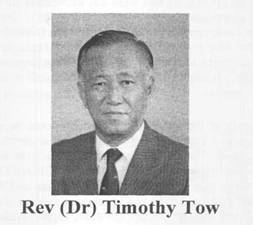 Born 1920, Timothy Tow was educated at Anglo-Chinese School, Singapore, graduating top of the Class and Seow Poh Leng Medalist in 1937. In 1947, in response to the consecration call of Dr John Sung in 1935 to full-time service, Timothy cancelled law studies in London, and enrolled at Faith Theological Seminary in America. At Faith, he imbibed the spirit of the 20th Century Reformation from Dr Carl Mclntire the President. Returning to Singapore, Timothy Tow, with Elder Quek Kiok Chiang (both of Life Church - Say Mia Tng) founded "Life Church English Service" in 1950. In 1954, the Tow-Quek duo formally withdrew Life Church English Service from the WCC-linked Chinese Presbyterian Synod. This was a crucial first step of "Biblical Separation. " Thus the B-P Church was inaugurated, mustard seed fashion, which today has grown into a global Church Movement, like a great tree, "... so that the birds of the air come and lodge in the branches thereof" (Matthew 13:32). To sustain an afternoon service at 4 pm in borrowed premises was a real challenge, to keep up interest and ward off drowsiness in those hot and humid Sunday afternoons, without air conditioning. Nevertheless, by God's grace, the congregation grew. Rev Tow was faithful in Preaching, Visitation, Prayer Meeting, and Family Worship. Those monthly family meetings held in homes of members proved to be a popular event in the life of the Church. It allowed the members and families to get together and to know one another. Labouring tirelessly in the service for over fifty years, he was "Pastor Available, " 365 days a year, 24 hours a day, "atyour service "to all who had a legitimate need. For the Lord's people he was ever ready to spend and be spent. In the building of God's House, Life Church Gilstead Road, he played a crucial role in its design, construction and funding. He patterned the design after the typical American country church, with a porch lined by seven stately Grecian columns, topped with a bell-tower and steeple. The building is now a national heritage. From the earliest days Rev Tow was fired with a burning zeal for souls. This sent him and Elder Hsu Chiang Tai on numerous missions to Malaysia's "New Villages" to evangelise the Chinese who were resettled by Gen Sir Harold Templer in the war against Communism. In those villages, his knowledge of Chinese dialects was put to excellent use. He spoke fluent Teochew, Hokkien, Hakka, Cantonese and Mandarin, to convey the Gospel message to the villagers. Life Church, true to its name, was full of life, like a fruitful vine bearing much fruit for the Lord. In quick succession Life Church brought forth many daughter churches: Sembawang, Zion, Kelapa Sawit, Kulai, Galilee, Calvary, etc. While a student at Faith Theological Seminary, Rev Tow first heard from Dr Carl Mclntire the call to Biblical Separation. His heart was strangely warmed, gripped by the clarion call, to ".. earnestly contend for the faith which was once delivered unto the saints "(Jude 3). Many of those who started out well, apparently striving together with us, have fallen by the wayside. But Rev Timothy Tow has remained faithful and steadfast, abounding in the work of the Lord. The motto "...for the word of God, and for the testimony of Jesus Christ" (Revelation 1:9) has kept him faithful, "holding forth the word of life " (Philippians 2:16) steadfast and unmoveable in his stand on the King James Bible, the Bible of the Reformation, the only Bible whose translators suffered the fires of Rome. While some BPs have defected from the KJV to embrace the NIV, NKJV, and other corrupt Modern English Versions, he continues to hold fast, unmoveable to the end. In money matters, Rev Tow was completely clean and meticulous. At Life Church Session meetings, it was always a difficult thing to persuade him to accept a pay rise. His chief concern was for the need of God's House. During the purchase of Beulah House (across the road from Life Church) at a cost of about six million dollars, his entire salary went toward the building fund: he led by example and the people followed. Thus inspired, the entire sum was realized in six months. A man of prophetic vision, he founded the Far Eastern Bible College in 1962. In his words: "Without a college to train our own workers, the BP Church will die. " FEBC to date has turned out over 700 graduates, workers for God's vineyard in all parts of the world. Not only does FEBC keep on enlarging its training programme, but it has helped to found Bible Institutes and Colleges in Myanmar, Indonesia, Kenya, Tanzania, Cambodia. Amazingly, in his eighty-third year, he left Life Church to found True Life BP Church. While men may wonder, we are persuaded that the thing is of the Lord for the words of Jude 3 still apply. Physical slowing down notwithstanding, the spirit was willing even though the flesh was weak. Spiritual Mentor to many BP pastors, Rev Tow continued faithful in the Lord's Service, steadfast, unmoveable, fighting the good fight of faith until the very end. Who will follow in the footsteps of this dearly beloved, faithful and fearless soldier of the cross of Jesus Christ? In 2003, Rev Timothy was found to be suffering from Alzheimer's disease and myelodysplasia (a serious malady of the bone marrow). Doctors thought he was not likely to live for more than one year. However, by God's grace and the Doctors' expert care, he survived until this morning, 20 April 2009 when the Lord took him in his sleep. Amazingly, he attended his last Lord's Day Worship only the day before. Praise the Lord. 'The Lord gave and the Lord hath taken away. Blessed be the name of the Lord. "